Store your weight plates securely when they are not in use with our range of quality weight racks and weight stands. They are also known as weight trees, vertical stands and toaster racks. They will help you to organize your gym and protect your weight plates from damage. Depending on what weights you have, they are available for Standard and Olympic Plates. Give your gym a smart and neat look with a quality weight rack or stand! Store your Barbells, Bumper plates and Kettlebells in one place! 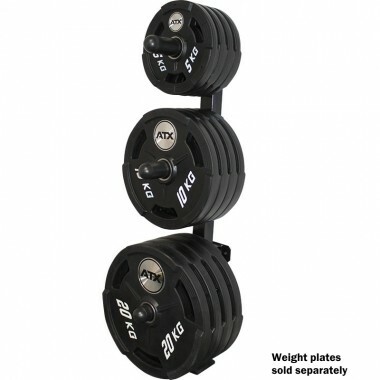 Power Maxx Olympic Weight Plate Stand with six olympic plate holders and two olympic barbell holders. Now in matt black! This rack is suitable for Bumper Plates, not just your ordinary Olympic weights, which is very handy. Save space and make your training a breeze with this wall mounted Olympic weight rack. This Barbell Stand is exceptional value. With plenty of plate storage and six Olympic barbells you won't find better at this price. 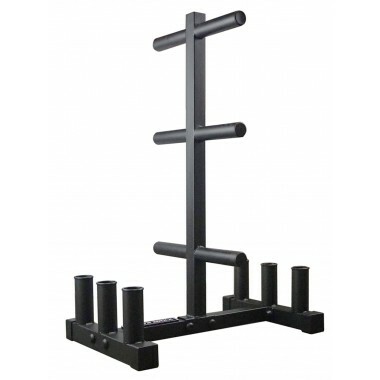 Standard Weight Plate Rack with 6 standard weight horns and two standard barbell storage sleeves. Just like an organised workplace is more efficient, keeping your gym organised will mean you will spend less time finding plates and more time lifting them. That is the aim of the game after all. If you own a gym or train people, you are required to do this by law. 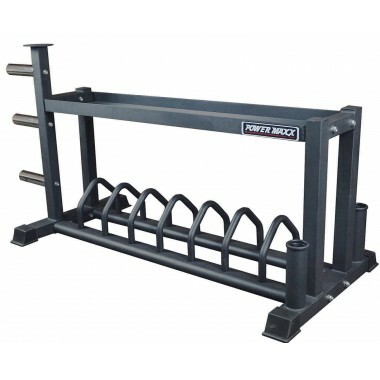 Our weight racks and stands will help you to increase your weight plate longevity – Plates come in rubber casings or are coated in chrome for a reason – to prevent it from rusting. It is hard to break the plates themselves, but it is relatively easy to chip the paint off. By storing your plates on the rack, you will prevent them from unnecessary damage. Treat them right and they will look brand new even after years of use! Safety – as silly as it might sound, weights laying on the gym floor serve as a tripping hazard. Ideally you would want your muscles to be sore, not your pinkie toe. Convenience – there is nothing worse when you can’t find a fractional plate mid set. Weight plate storage will help you to stay organized and avoid that frantic feeling you get when you can’t find a plate. Multifunctional – The more space you save the more space you will have for more gym equipment. Most of our racks offer weight and barbell storage. You can either use it for your specialty barbells or convert the barbell holders into a functional T-bar row. 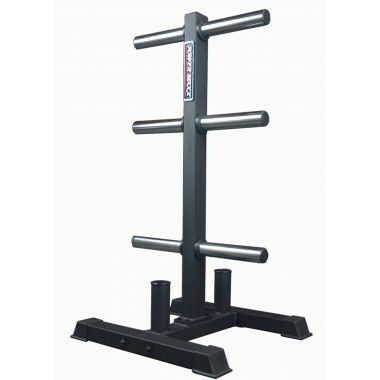 The Wall mounted Olympic weight rack (BB-3021) sticks out only 40 cm. If you are extremely tight on space and have a wall you could use, this is your rack of choice. It comes with three Olympic sleeves and offers plenty of plate storage without taking up precious floor space. The only downside would be the mounting, once it is bolted down to a wall, you won’t be able to move it without having to drill new holes again. Vertical weight trees are compact, durable and efficient. 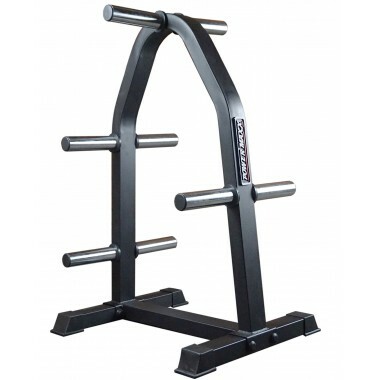 These racks offer a compact footprint allowing you to place them anywhere in the gym. Vertical Stands come with either six or eight weight horns giving you ample storage space for hundreds of kilos worth of weight plates. Some of the vertical racks also come with barbell storage, it can be used for your specialty Olympic bars or for ATX landmine attachments. 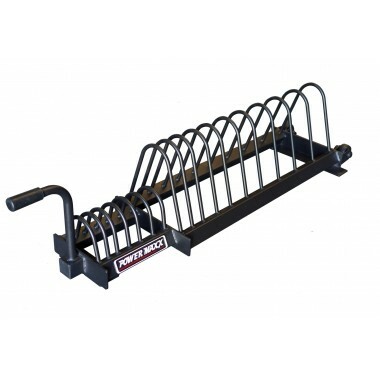 Horizontal Racks are designed to hold multiple sets of bumper plates. They occupy a larger footprint, but they compensate for it with one great feature – weight slots. The weight slots are designed for the thicker style solid rubber bumper plates. If you don’t have these plates you can still store normal plates. As these are thinner, you will be surprised how many you can fit. The Toaster style horizontal racks also feature wheels, making it easy to move around your gym. The main factor you will need to consider is the type of plates you have. Certain plates work better on certain styles of racks. Bumper Plates are made to be the same diameter. But their girth can vary dramatically. Storing them on a vertical rack would require equal horn spacing, which is not very convenient as it would make the rack too tall. 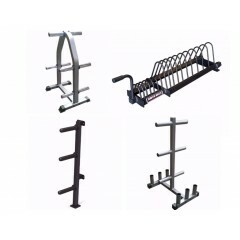 Best racks for these plates are: Toaster Rack; Bumper and Barbell Rack, Olympic Weight Plate Rack. Powerlifting Discs – due to the slick finish of these plates they are quite difficult to handle, especially with sweaty hands after a heavy set. They are also very thin, and this means they sit loosely in toaster style bumper racks. Best suited racks for these plates would be: Olympic Weight Plate Stand, Olympic Weight Plate Rack. Regular Olympic Rubber Coated Plates –Since they come with a tri-handle design, they are extremely easy to handle. You can virtually store them on any rack! Standard Plates – Our Standard Weight Plate Rack is specifically designed for weight plates with internal diameter of 29 mm. If your plates are slightly smaller you can opt for Olympic bumper racks. 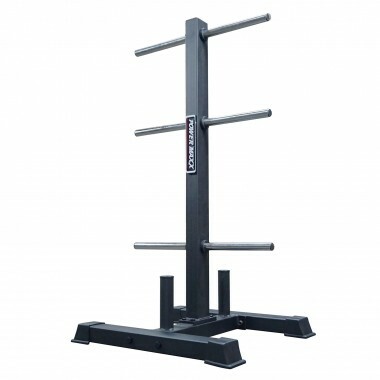 The Olympic Plate Barbell Stand offers quite a few attractive features like six weight horns for plate storage and six barbells storage slots. The footprint is tiny when you think about what it can store. But the main attraction is its price. This price is achieved by painting the sleeves instead of using chrome. The downside of this method is that horns will scratch as soon as you start using them. If aesthetics is high on your agenda this is not the rack for you. For those gym rats who don’t care about a few battle scars then this rack is for you!